Welcome back Maharanis! 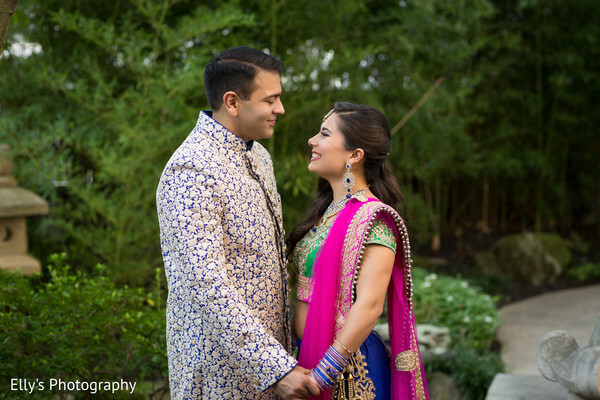 We hope today’s feature overwhelms your heart with joy as we showcase all the wonderful details of Christine and Samir’s modern day romance. Fusion weddings are one of the funnest weddings you will ever get the chance to attend. 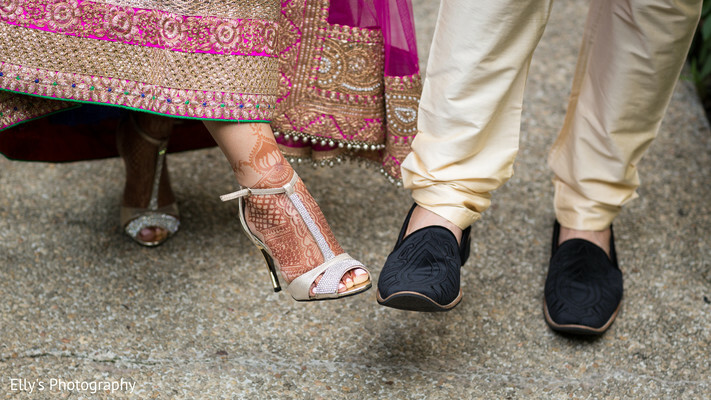 The intertwining of two different cultures and backgrounds is only the beginning of the celebrations. There is so much to soak in! 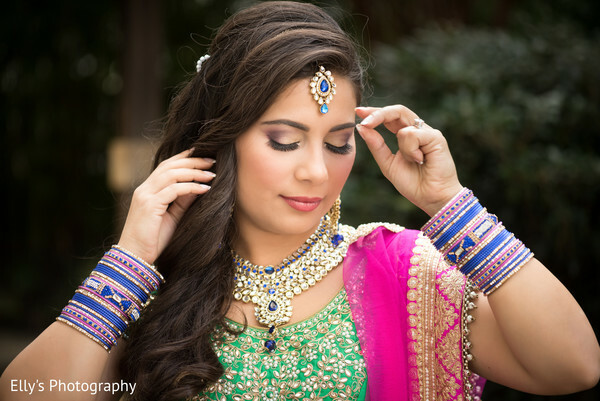 Planning a fusion Indian wedding most certainly requires more work and Envi Event Planning was brought on to spearhead creating the perfect layout to create Christine’s dream fairy tale dream wedding. 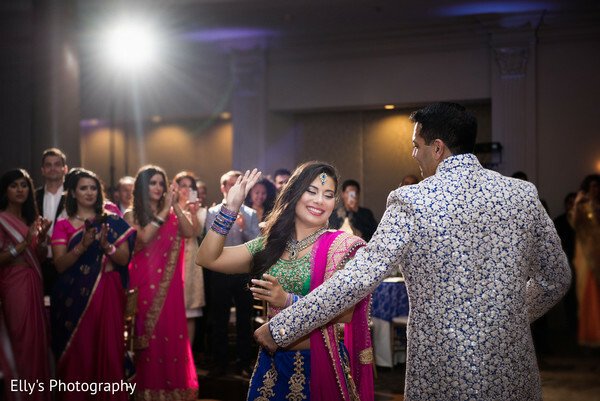 For her sangeet night at the Spring Hall, the bride knew she wanted to pop from the screen. 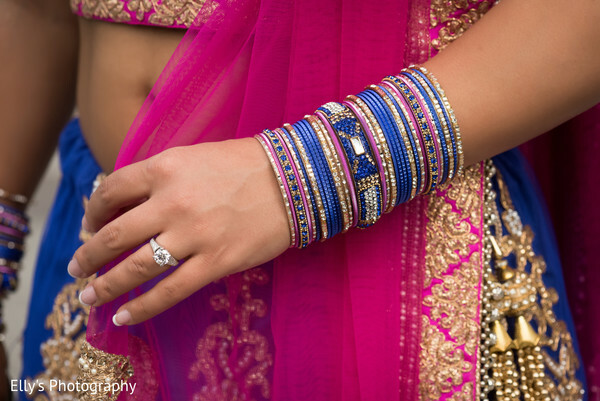 Her multifaceted lengha was a celebration of a multitude of colors that incorporated pinks, greens, and blues. The outfit was perfect for a night of dancing and the ceremony was full of laughter and performances. Samir most recently has done his research in the romance department and pulled out all the stops to make his surprise proposal one of the best we have ever read. 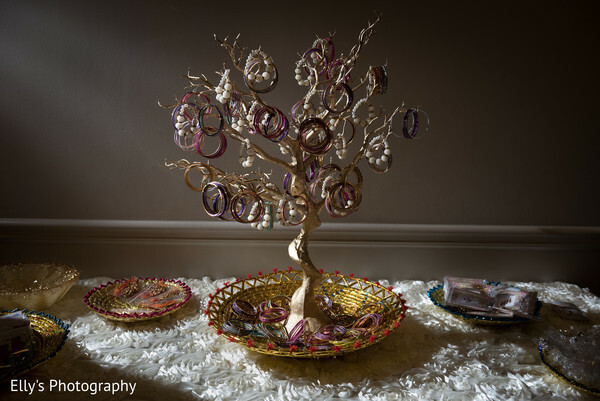 If you want all the details, head to the bottom of the gallery after you peruse through these gorgeous images captured by Elly’s Photography. After dating in New York City for a year and a half Samir decided to move back to his home, San Francisco, to start a business. We continued to do long distance for a year. My family moved into a new home that year and started discussing planning a house-warming party. I helped organize and planned to go to Atlanta where my family lives, for the party. On April 2nd, which happened to be Samir's birthday, my best friend asked me to attend a business meeting with him as support. I was dressed well and had my nails done, thanks to my roommate, and decided to let Samir enjoy his birthday and not constantly call or message him since he was ignoring the calls that day. I arrived at a hotel in Times Square and entered the lounge area where I searched for her friend. From the end of the bar I saw a woman taking pictures that were directed towards me. As I walked closer to her searching for my friend, I realized the photographer was my roommate. As soon as I saw her I knew Samir would be close. When I looked at the bar I saw Samir turn around on the bar stool with a wooden ring box he had carved. After a speech, some champagne, and plenty of tears, Samir had organized a private dinner for the two of us in the hotels rooftop balcony which overlooked times square. Once dinner was over Samir said "we are going out" so we headed to a bar where I instantly saw co-workers, my boss, and our friends all gathered to celebrate our engagement. Samir had contacted everyone and invited them out. The following day Samir told me he was coming to Atlanta for my parents party. When we landed in the Atlanta airport another surprise awaited us. My brother, Samir's brother, sister-in-law, and parents all flew in within an hour of when we landed to celebrate with us that weekend. My parent's house-warming party quickly became an engagement party and a three day span full of surprises. Tell us how you went about planning your wedding, and your overall experience with the Venues, Hair & How did you select your bridal lengha or wedding dress? Did you have a favorite color in mind? 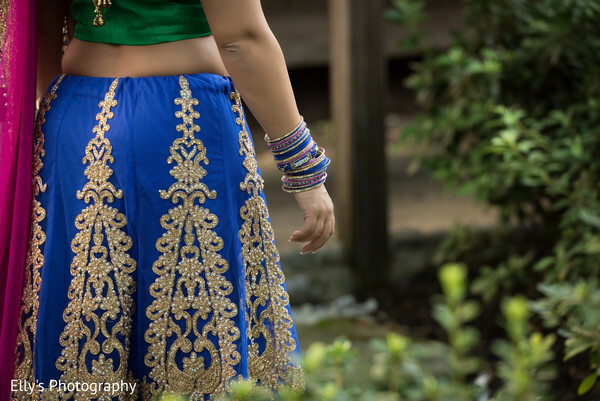 My bridal lengha and sangeet lengha were both from India. 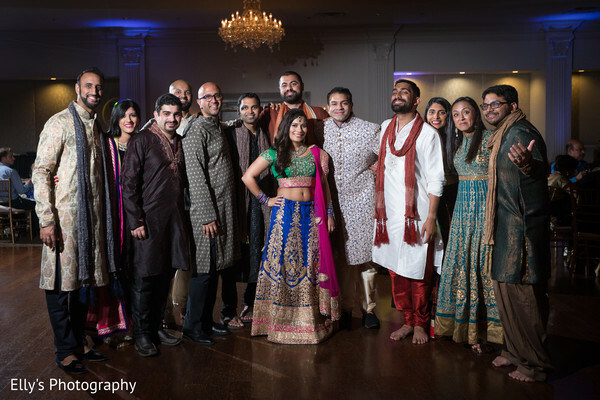 For our reception in California I stuck to the traditional red and gold but for my sangeet I wanted to wear every color because I could not choose. I chose bright and happy colors of blue, green and pink with gold details. Food and cake tasting and attending bridal shows were the most fun. I went with family and friends to a number of different events which brought me closer to all of them. At the wedding the most enjoyable part was seeing all the hard work, meetings, decisions and plans come together. It is hard to envision how everything will work but I learned to trust my vendors and was absolutely blown away by how beautiful it all turned out. My entrance which was a last minute change due to a fountain flooding. For our ceremony we had initially decided to have the bridal party, family and groom walk down the stairs of the Swan House gardens and me, the bride, to walk down the aisle. This way we would have pictures from both sides of the ceremony. When we arrived at the venue our coordinator told us the fountains had an issue and flooded the ground making my plan to walk down the aisle a bad decision. As a result, we made a last minute change to allow me to walk down from the Swan House at the very top of the stairs. This last minute change became the highlight of the ceremony. My guests told me that when the doors opened up at the top of the stairs and I walked out there was a brief moment of gasping and emotion that was shared by all the guests. This was a pleasant surprise because it wasn't one of the hundreds of details we had planned and became a highlight for so many people. I was quite surprised at my own reaction during my father-daughter dance. Throughout the entire dance I was crying profusely. Each time I think about this dance I still get emotional but the thought that helps counteract it is my memory of our parents dancing with us throughout the entire night. We have photos of my dad dipping all the way to the floor and our mothers dancing together throughout the evening. We made sure to dance throughout the entire evening and felt that we got to see almost all of our guests on the dance floor. The best way to organize everything you have to do is to get a timeline and begin working through it. I had a binder that my maid-of-honor gave me with a 12-month planning timeline. I went through it, highlighted the areas I was going to concentrate on each month and made sure to organize my planning around it. Best thing I received for my wedding planning. Lastly, something will absolutely go wrong but it is totally true when guests tell you they don't notice. We had a number of things go wrong but no one knew but us. 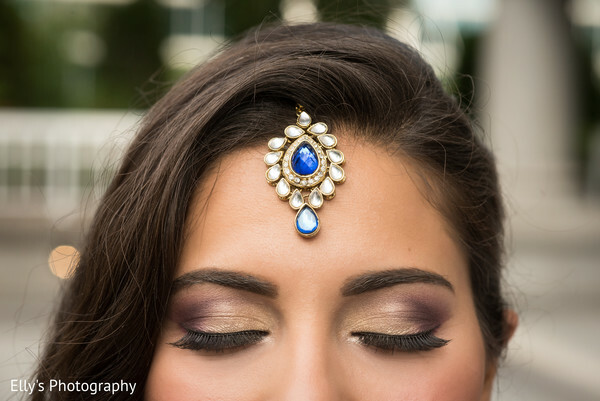 We have a gorgeous venue and Maharani coming right up for the wedding ceremony!